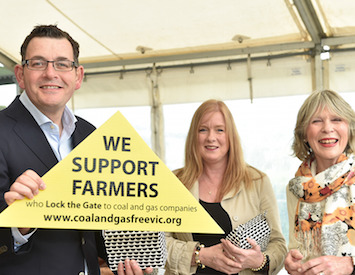 Victorian Premier announces fracking ban (image via premier.vic.gov.au). Rinehart, Bolt et al can blame the Andrews Government, but it won't bring back already depleted gas supplies, writes Tracey Anton. THE PETROLEUM INDUSTRY might think they can intimidate the Andrew’s Labor Government, but they can no longer intimidate the people. The fallout from the Lakes Oil judicial review and subsequent claim for damages from their conventional gas tenements appears to be an ill-conceived smokescreen spreading misinformation, purely to undermine the passing of the Bill to permanently ban onshore unconventional gas. If the "big gas" was actually there, as Lakes Oil imply with their $2.6 billion claim for loss of future earnings, why are they claiming it now? Onshore conventional drilling is only under a moratorium, not a ban. Although the current claim is on a point of law, there are numerous sections of the Petroleum Act 1998 that give the minister discretionary powers to cancel a licence. Under 'Objectives', the Act refers to economic, social and environmental interests — ensuring that the impacts on individuals, public safety, public amenity and the environment as a result of petroleum activities are minimised, as far as practicable, and that there is just compensation for access to and use of land. Operating Risk: Industry operating risks include the risk of fire, explosions, blow-outs, pipe failure, abnormally pressured formations and environmental hazards such as accidental spills or leakage of petroleum liquids, gas leaks, ruptures or discharges of toxic gasses, the occurrence of any of which could result in substantial losses to Lakes Oil due to injury or loss of life, severe damage to, or destruction of property, natural resources and equipment, pollution or other environmental damage … The occurrence of an event that is not covered, or fully covered, by insurance could have a material adverse effect on the business, financial condition and results of operations of Lakes Oil. The following statement in their June 2009 'Quarterly Activities Statement' is of monumental proportion as it is what the whole debate is about — don’t mess with our groundwater. The Seaspray community is well aware of Lakes Oil’s regulatory blunders. When contractor Petrotech (plaintiff in the claim) was flaring a gas well in the company of Liberal Party heavyweight, John Elliott, which caused a fire in 2010. Then there is siting a gas well 150 metres from a creek and 525 metres upstream of the township's water supply. Part 16, Section 252 — the Governor in Council may make regulations for or with respect to. The minister must also consider other legislative frameworks in granting approvals aside from the issues of land conflict, water availability and adequate policy frameworks, to prevent risk to the person and their interests. These other environmental impacts from previous and existing offshore conventional oil and gas extraction are what the petroleum industry and their influential political partners have been trying very hard to avoid. A prime example of the spin is Andrew Bolt’s interview (starting at 7.44 minutes) with Roland Sleeman, CEO of Lakes Oil. As for the price of gas, it is not going up because of green policy as Bolt states, it is going up because of the lack of foresight by our governments. In 2014, financial analyst Bruce Robertson was already predicting wholesale gas price rises once the domestic market was exposed to world pricing. Yet, two years on, Bolt still claims it is the farmer’s fault for the high price of gas. The only way Victoria can solve its gas shortage is with a gas reservation policy, which has not been supported federally or by the petroleum industry. Now media blame Labor’s gas ban instead of researching the facts, which data, both published and unpublished, note no conventional gas accumulations have been found to date in the onshore Gippsland Basin, with some potential "small fields" in the Otway Basin. These will not answer our long-term energy problems. The "big gas" just doesn’t exist and Victoria’s pending gas crisis is because there is only a finite supply — not because the government is banning exploration onshore. So how can Lakes Oil price compensation, when the recoverable volumes of hydrocarbons in their Otway and Gippsland permit areas from deep geological formations are unproven and only inferred? They have run a successful marketing campaign on hydrocarbons for decades, and serviced a legitimate exploration industry in that same time without producing any oil or gas. Instead, they have left a trail of dangerous and unmaintained waste pits and abandoned, corroding wells, whose maintenance is binding on subsequent owners and government. One such well at McLoughlins Beach from the 1950s is now way offshore due to coastal subsidence. Existing land access agreements between Lakes Oil and the landowner have been drafted in such a way as to deny the landowner full disclosure of risks and potential liabilities. The doctrine of contra proferentem would be a landowner’s lifeline and should be used against this company. Their ten-year share price couldn’t even rise above $0.02, when joint ventures came on board with Armour Energy in 2011 and Gina Rinehart in 2013 — only reaching a staggering height of $0.007. Lakes Oil operate in groundwater basins with an extensive limestone interface separating onshore boundaries (think Great Ocean Road and the fragility and brittleness of the limestone cliffs) but there also exist extensive faulting offshore. The new concern is the potential for liquefication at the Seaspray interface in Gippsland, from increased seismic activity. In Victoria we currently have an incomplete understanding of the potential earthquake-related risks including ground liquification (where the soil structure is changed by the shaking and can begin to flow), landslide and damage to infrastructure such as gas pipelines or power supply networks​​​​​​​. The Lakes Oil judicial review might be the biggest mistake this junior miner has ever made but it could just be the catalyst for change.